Join us at the Veblen House this Sunday, June 11 at 10am, before the day heats up, to pull garlic mustard before its seedpods have a chance to burst. We'll have some refreshments on hand, the better to socialize while snipping off the seedpods. Veblen House is up the gravel driveway across the street from 443 Herrontown Rd, or walk up from the main Herrontown Woods parking lot off of Snowden (map here). The Friends of Herrontown Woods has transformed the grounds of the Veblen House in recent years, removing invasives, opening up sight-lines and exposing interesting historic features. A crew hired by the town of Princeton also assisted this past summer, removing the very thorny Japanese aralia. Removal of garlic mustard is an important step towards repopulating the property with native plants. Thanks to the town's intervention, the county has at least temporarily suspended movement towards demolition of the Veblen buildings. FOHW is seeking to work with the town and county in the interim to determine a way by which FOHW could begin repairs on the structures and put them to use. 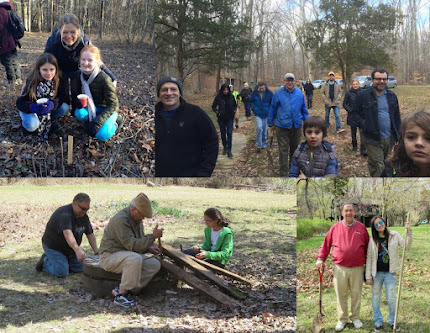 FOHW is proud of having taken the initiative over the past four years to restore and maintain Herrontown Woods, and believes it has proven itself up to the task of repairing the buildings as well.